You are here: Home / Investing / Canada Pension Plan – What Should I Expect? 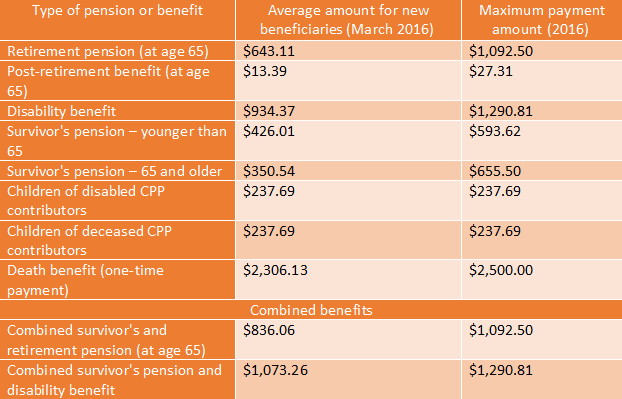 Canada Pension Plan – What Should I Expect? By now most Canadians will be familiar with the basics of the Canada Pension Plan, otherwise knows as CPP. They know that it gets deducted form their paycheques, it has to do with something about retirement, and some money coming into your pocket. What we want to talk about here is the finer details of the CPP to give a holistic and in depth understanding so that you can plan your retirement with the right tools. The CPP provides a partial replacement of earnings in the case of retirement, death, or disability. You can get the regular CPP payments at age 65, or if you are willing to take reduced, or extended payments, you can get it at age 60 or 70. By design it is meant to replace up to 25% of the average wage in Canada. However, be careful about taking that retirement cheque early! Below are the rates per month that your pension goes down if you take it early. This equates to a 36% reduction if you take it at age 60 in 2016! Your contributory period begins when you reach age 18 and ends either when you start receiving your CPP retirement pension, turn 70 or die, whichever happens first. So what do you actually contribute? If you are employed your contributions will be split equally between you and your employer, whereas if you are self-employed you pay this yourself. You start paying towards CPP on earnings above $3500, this being the minimum. This minimum is fixed and does not change. You contribute within this minimum and a maximum, which is indexed for inflation. The maximum for 2016 is $54,900. So, how much will I receive from my Canada Pension Plan? You can take each one of these individual benefits and break them down into their own segments, limits, and uses. However this is not the goal here, we are looking to get a holistic overview to enable proper financial planning for your future. The General Dropout Provision automatically drops some of the lowest earning months from your CPP calculation. In 2014 this 17% which translates into up to 8 years of your lowest earnings being dropped. The Child Rearing Provision unlike the general dropout provision, is not automatically applied. However, if your earnings were lower, or zero because you were the primary care-giver of a child under 7, then you can apply to have this period also excluded from your CPP calculation. One of the key things to do if you haven’t already is get registered on “My Service Canada”. Creating an account here is one of the most beneficial things you can do for yourself, it saves time and allows you to view all your information and make changes online. Whether you are retired or not, trust me, this will smooth out the process for your future, especially if you forget where all your papers are! If you are a numbers person and want to play around with difference scenarios, check out this page. It is a very informative and visually descriptive tool.